The past ten days have been all sorts of adventure! A picture book project I'm working on had its deadline trimmed short, necessitating FHDM (Full Hunker Down Mode). Happily, the manuscript didn't suffer and I was pleased with what I submitted. Not surprisingly, though, there are now... complications... so it appears that I'll be spending the next few weeks doing re-writes. More on that later--like, next week sometime. For now I want to take a moment to expose my inner geek. Late last week a shiny new toy arrived via the FedEx Man (thanks, George!) in the form of a new MacBook Air ! You've probably seen the commercials--Apple seems to be running them on every channel at 90-second intervals (or so it seems). So what's the verdict? Only a heaping spoonful of awesome! Not since Blu-ray in 2006 has a new gadget exceeded its hype with such splendiferous panache, right out of the box. The Air is light, nimble and very fast. In a way, it is everything I am not. I guess you could say it completes me. 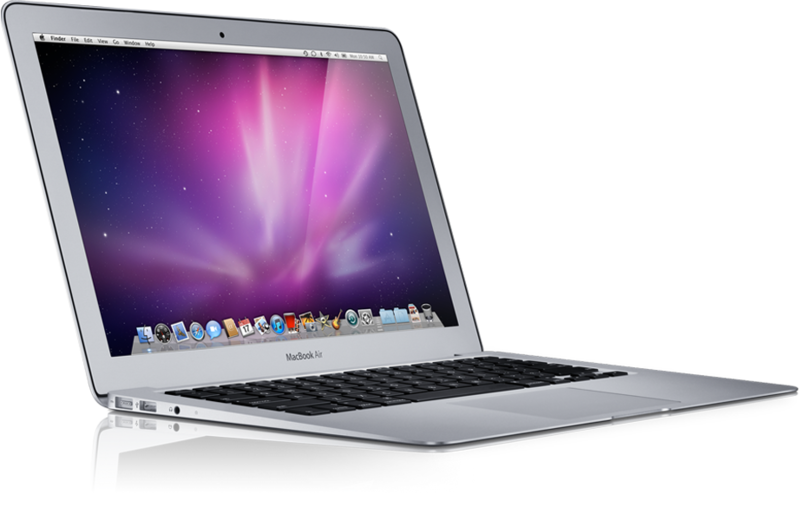 If you're unfamiliar with this Magical Device of Wonder, the MacBook Air is Apple's newest ultra-portable laptop. Available in both 11.1" and 13.3" screen sizes (I got the bigger one, of course), the Air is ridiculously thin, tapering down from a slender 0.68" to an Olson Twin-like 0.11". It skips the CD/DVD drive, which is arguably unnecessary in a world where everything is available as a download. Instead of a magnetic hard drive like most computers, it utilizes the much faster Flash memory--a whopping 256 GB in the model I chose. Apple also integrated a series of smaller batteries instead of one big, heavy one. All of this adds up to, well, it doesn't add up to much--the Air is a modest 2.9 lbs. That's significantly lighter than any other notebook on the market, and just slightly heavier than Apple's iPad or Kate Moss holding a dictionary. When Apple first announced the tech specs on the Air, many critics argued that it wouldn't be able to compete with other ultra-portables in terms of performance. Coming from a heavier, monstrously powerful MacBook Pro, I have to say that the Air keeps pace nicely for what I (and most people) use a laptop for: browsing the web, writing, playing around with photos, and the occasional game or two. Some of this efficiency is due to the fact that yes, Apple did opt for a slower, less power-hungry processor, but they utilized the speedier Flash memory and also incorporated a very spry graphics processor. The trade-off seems to work well--the Air goes from Off to Ready! in about 11 seconds (most Windows laptops take about 45-120 seconds to boot up by comparison) and waking it from Sleep mode is, literally, instant. The most important change I've noticed in comparing the Air to my old MBP is that battery life is worlds better. The Pro gave me (maybe) around 2-3 hours of battery life. WiFi use, playing videos, and anything else even moderately taxing would drag that average down to 01:45 or so. With the Air unplugged, I'm still amused when I look at the estimated battery life and see 08:15--it never gets old! Now, I'm a fan of Apple products, but I'm no fanboy. I understand the Air isn't for everyone. In fact, I'd say the market for an ultra-portable is small compared to tablet devices like the Samsung Galaxy or the iPad . But for what it does, the MacBook Air does it all exceptionally well, at least for me, at a price that isn't hard to swallow for this kind of tech (they start at $1199). And while I don't think it will make me a better writer, it certainly does improve my mood and eagerness to write when I get to do it with a fun new toy. It makes me wonder... did Shakespeare enjoy writing more when he got a cool new pen? Do you get a nice "shot in the arm" when writing on a new computer, laptop or (*gasp*) pad of paper? Nothing like a cool new gadget to brighten your day! I'm with you, man. My iPad still rocks, even after seven months of use. I bet your will write great things on it! I love my Mac. No, really, I LOVE my Mac. I wonder if ol' Will got excited about a new pen? My guess would be yes? @Samantha - Same! Life is so much better since we switched from PC.